The holiday season is a joyous time, but, unfortunately, it also brings along a rush for holiday shopping. Shopping for gifts and party decorations, accompanied by entertaining guests or visiting loved ones, can take a lot of time and can increase your stress levels. According to the American Psychological Association, 8 out of 10 people experience increased stress levels over the holidays. There are several ways to manage stress and anxiety through the holiday season so you can focus on what the festive time is about: to have a fun-filled and relaxing time with your loved ones. Get organized. Make a list of everything you need and where you can buy them. Do research online in advance to find out where you’ll get the best deals. Being organized will reduce the time you spend running around, and you’ll be less likely to forget something. Know your budget. Holiday stress is often caused by spending money you don’t have. Setting a budget and sticking to it will minimize impulse buys that you’ll regret later on. Don’t wait too long before you start shopping – last minute shopping increases stress levels. Shopping earlier will also give you more choices. Ask people what they want for gifts, instead of searching near and far for the “perfect” presents. Knowing what people want takes the guesswork out of the search, and you’ll be confident that they’ll like what you get them. Be inspired by what you see in the shops and let go of the idea of a perfect gift. Avoid traffic and busy shops as much as possible. Traffic and shops are the least busy on weekday afternoons and evenings. Shop online. You can pick up great deals on Cyber Monday, the Monday after Black Friday. Many shops will also deliver at no cost for sales above a certain amount. Make your own gifts. If you have time and are crafty, making your own presents is personal and affordable. Creating things with your hands is also relaxing, and can get the whole family involved in a fun activity. The shopping rush can be physically strenuous on your body. Wear comfortable shoes and clothes on shopping days. Take a backpack or trolley bag with you to decrease the strain on your body from carrying heavy shopping bags. Stay well hydrated when shopping. Bring warm water mixed with lemon to keep you well fueled. 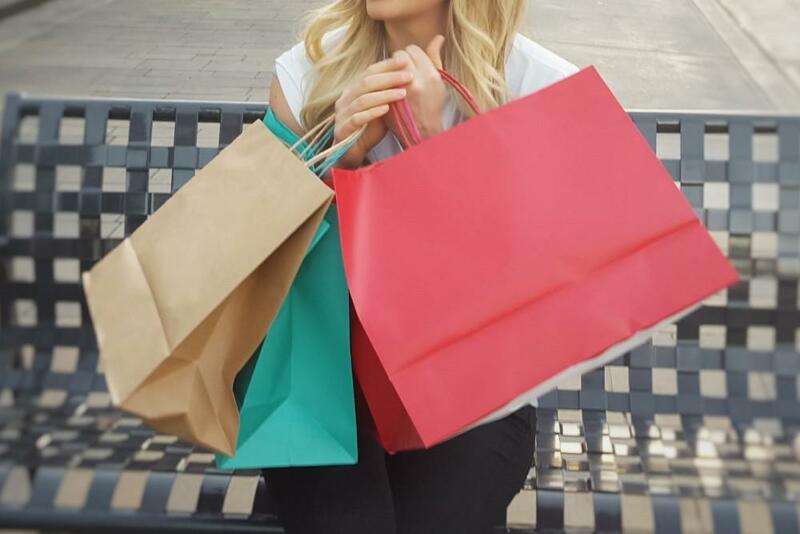 Shopping stress can often result in anxiety attacks, especially on busy days like Black Friday. A good idea is to know some breathing and grounding techniques to help you calm down when your blood starts to rise. The abdominal breathing technique is a useful skill to help you relax. To master this technique, place one hand on your abdomen and the other on your chest. Take a slow, deep breath through your nose while focusing on the air entering your lungs. Inhale for about four seconds. If done properly, you will feel the hand on your abdomen rising higher than the hand on your chest. Exhale slowly and fully through your mouth for six to eight seconds. While exhaling, gently contract your abdominal muscles to push the remaining stale air out of your lungs. Repeat for a total of twenty slow, deep breaths, or until you feel that you’ve calmed down. Try a grounding technique that engages all of your senses: When you get anxious, take a break and concentrate on your surroundings. First, focus on your sight: Name five things that you see, whether the blue skies through the window or a cute little baby passing in a stroller. Touch: Let water run over your hand, or touch the arm of your companion. Smell: Breathe in the fresh air or the aroma of coffee from a nearby coffee shop. Hearing: Listen to the music that is played in the shop or the sound of the barista making coffee. Taste: It may be time to take a sip of that coffee now! Run through your five senses while focusing only on them, and nothing else. You will find that your blood slows down and your stress levels drop. Whichever techniques or tips you decide to use, you will feel that you can finally get a handle on your holiday shopping stress. If you need any more shopping or stress management tips, get in contact with Dr. Payal Bhandari M.D. for advice.